aGupieWare: Space Station Sunday: Three Cheers For The One-Year Crew! Space Station Sunday: Three Cheers For The One-Year Crew! Happy Sunday, space fans! It's been another outstanding week in orbit, and an exciting week ahead. Here's what was up! before they're much more difficult on Earth. On Friday, the three crewmen of Expedition 47/48 attended traditional pre-launch ceremonies in Moscow. They laid roses on the graves of Russian space heroes, interred at St. Basil's Cathedral in Red Square, among other pre-flight activities. NASA astronaut Jeff Williams and cosmonauts Alexey Ovchinin and Oleg Skripochka will be launching on March 19th for the ISS. prepare to do battle with gravity. Before they head up, however, two very special spacemen are slated to come home. Astronaut Scott Kelly and cosmonaut Mikhail Kornienko (along with cosmonaut Sergey Volkov) will be returning to Earth on March 1st. The event will be broadcast by NASA TV and is slated to take less than 3.5 hours. According to a final interview from space that Kelly conducted with CNN, the Soyuz return vehicle will travel at 755 feet per second through the atmosphere, and will be slowed to 25, then 5 feet per minute by four parachutes approximately 15 minutes before landing. Two sets of three engines will fire for one second to cushion the landing. Kelly explained in a "Space To Ground" video from the ISS this week about how much he's looking forward to the return voyage. "It definitely gets your attention...It's so much fun, for me, that I had said that, you know, after my last flight, if I would have hated being in space for six months, I would have done it all over again just for that last twenty minutes in the Soyuz. It's that type of an experience." An ideal and deceptively peaceful-looking Soyuz landing. And when that Soyuz touches down, it's immediately back into scientific testing for the crew. A flight surgeon will be on hand to note the astronauts' adeptness at standing upright, standing from a seated position, walking over obstacles, and other seemingly-mundane tasks that are an important assessment of the astronauts' physical functions upon returning from a micro-gravity environment. The studies conducted upon their landing will aid with recognizing the capabilities astronauts might have when landing in a difficult environment, such as a sea landing on Earth, or on a foreign body like on an asteroid, or Mars. Meanwhile, former NASA astronaut Mark Kelly explained in this NASA video the efforts he has helped contribute to the cause of space science, all while residing comfortably here on Earth. From blood draws to MRIs and ultrasounds, Kelly has subjected himself to the same intense scientific scrutiny that his orbiting twin brother has, and the results will be a fascinating comparison between the two biologically-identical subjects. Mark (with moustache) helps out his bro. Kelly noted that he was ready to continue providing scientific data, whether the continued experiment took a month or ten years. He currently has no further plans to head into space, having served on the ISS four times before retiring in 2011. His brother Scott has served on three ISS missions (including this one) and one Hubble Telescope servicing mission. Oh, and we have Mark to thank for aiding his brother (and chase victim astronaut Tim Peake) in the greatest space prank ever. A very special delivery apparently showed up on the last supply flight, courtesy of Mark wanting Scott to have some fun. That's ASTRONAUT Kong, to you. But seriously, the countdown to touchdown is on, and the world is watching. "Countdown: 5 days and a wake-up! Every mountain is within reach. 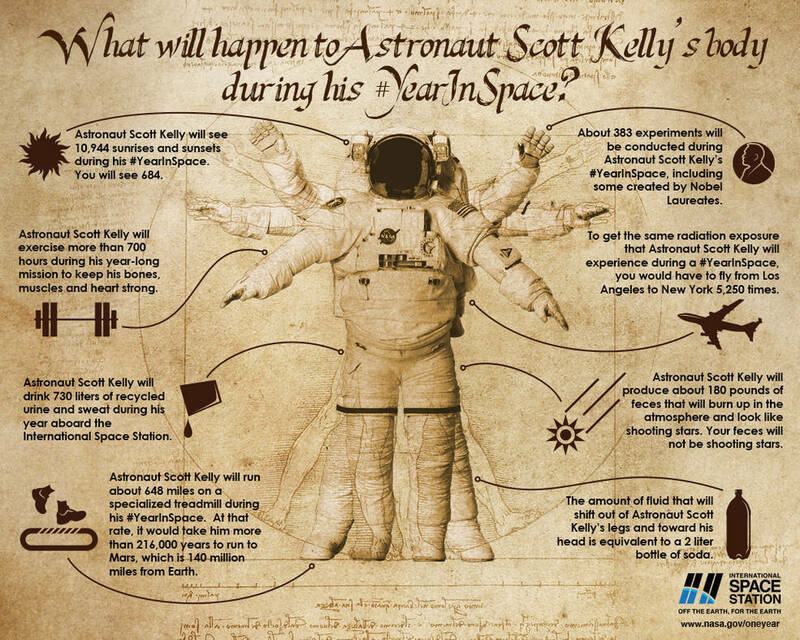 NASA noted some of the major things Kelly will have to readjust to on Earth. They also created a related Tumblr, and noted ten highlights from the Year In Space mission. No more pouch-cooked food is a huge bonus of returning to Earth. NBC featured a retrospective of some of the most striking images from Kelly's mission, and he hasn't stopped shooting! Here's some of the final images Kelly captured in his last week in space. "Ice!" -Scott Kelly, brilliant scientist. but looking forward to sandy beaches up close." "Of all the sunrises I've seen on my #YearInSpace, this was one of the best! One of the last too. That's all for this week, space fans! We'll see you next Sunday with all the news about the men who fell to Earth! Watch this space! will probably taste really nice. it looks very cool. real fraternity. it would be interesting to look at their video diary. where can I find it? Reading good books is quite interesting. Reading books is like dreaming with open eyes. I am also fond of reading books. I spend most of my spare time in reading books from cheap essay writing service and enjoy the different story. It is all because of education that had made me able to read books.